I like to tunnel SSH, whether it's for getting around a captive portal at an airport or for encrypting your traffic at DefCon. 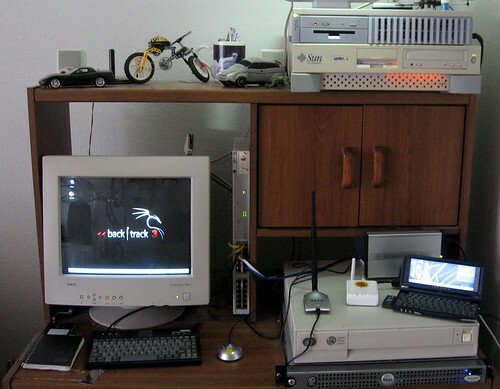 At home, I use an old NetScreen1 5XP-Elite firewall. The "Elite" has absolutely nothing to do with its mad $k1llz. It just means it's got an unlimited network license, which is good because I have a lot of freaking computers in the Lab-O-Ratory. ###Invalid reserved vip port number 53 for SSH service! Notice that the web admin interface is only running on the internal interface, so I'm tunneling port 80 direct to it through one of my systems on the inside, hence the localhost:80 http session. I opted to redirect port 2201 to the internal SSH box, since it's well within the range of acceptable ports. 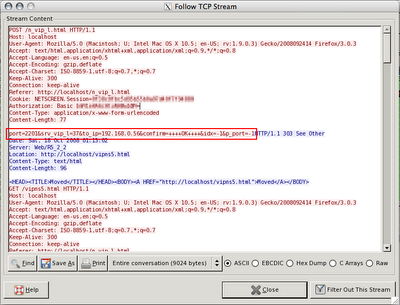 I did a "Follow TCP Stream" and VOILA! This gives me everything I need to make a quick HTML file that posts whatever port number I want as the "port" variable. I decided to take the easy way out and see if NetScreen's web interface would accept the variables as a GET, by pasting it into the location bar instead, just to see. I broke it up into three lines here, but you can see the only thing I changed was "2201" to "53". What's the point? This was a practical example for how to putz around with stuff you may already have and dabble in the fascinating world of web application security. As mentioned before, it's also an exercise in thinking beyond limitations. NetScreen was founded by a bunch of ex-Cisco guys and the IOS-esque "ScreenOS" as it's called really shows it. In 2004, NetScreen was snarfed up by Juniper Networks. Juniper's low-end SSG-5 is about the closest living relative to my beloved yet crufty home firewall. On an odd side-note, Frogman and I got to see Gerald Combs (creator of the project now called Wireshark) give one of his very, very rare talks on TCP/IP, which included a lot of Ethereal's backstory. OpenBSD 4.4 is hitting the mirrors now! Friday Geek-Out: WiFi Disruption Edition! Do you think this guy's a gamer?